Bone Fractures, or broken bones, are often caused by forceful impact to or repetitive stress on one of your bones, and fracture can be debilitating, affecting your ability to perform your usual daily activities. Motor vehicle accidents, falls, and direct blows experienced during sport activities are among the leading causes of fractures. Fractures are particularly common among older individuals. 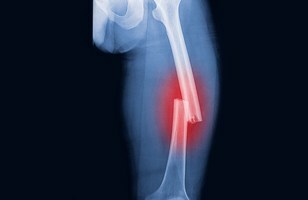 Hip, wrist and upper humerus or upper arm, fractures are the most common fracture types in both men and women over 55. Fractures can be classified in several different ways, traumatic, pathological and anatomical. Pathological fractures, unlike those fractures caused by trauma, require a deeper investigation to determine the true underlying cause of your break. Pathological fractures are caused by diseases that weaken the bone, such as osteoporosis, cancer, infection sand certain inherited bone disorders. Fractures are also classified by how your bone breaks, compound, simple, compression fractures. Compression fractures, which involve the collapse of a vertebra, most commonly occur in the lower thoracic and upper lumbar spines, and in postmenopausal women. 25 % of postmenopausal women are affected by compression fractures, and this increases with age, up to 40 % in women who are over 80 years of age. Vertebral compression fractures are a serious problem affecting spine health in older mean and women. Your chiropractor may use several gentle treatment methods to promote healing of your injured bone and other tissues during the immediate and long-term phases of your recovery. Your chiropractor’s approach to fracture care may include; therapeutic taping procedures that help reduce swelling and bring nutrients to your damaged tissues, physical therapy modalities that help heal your injuries and simple exercises that you can perform as soon as possible after the removal of your splint or cast. Your chiropractor may also perform adjustments or soft tissue work in other parts of your body to help you maintain good general joint mobility and promote a high level of health and well-being during your recovery.